Today the North London Derby between Arsenal FC and Tottenham Hotspur is known as one of the biggest rivalries in European Football. 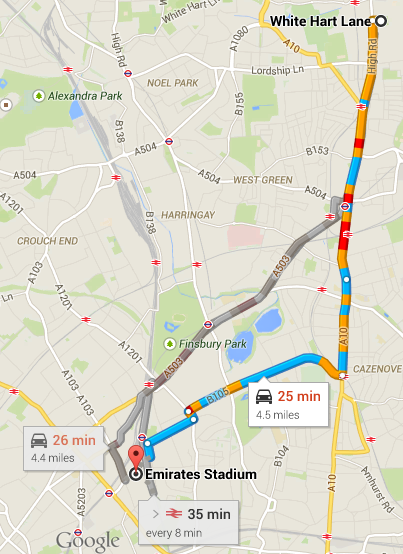 Emirates Stadium and White Hart Lane, the homes of Arsenal and Tottenham, respectfully, are roughly a 4.5 mile drive apart (seen below). However, this was not always the case. The driving distance between Emirates Stadium and White Hart Lane (Google Maps). The driving distance between Woolwich and Emirates Stadium (Google Maps). Arsenal FC were founded in 1886 by workers of the Royal Arsenal in Woolwich, which is located in South London. However, their attendance suffered as Woolwich was less populated than other areas of London, and as a result, the club had poor finances. 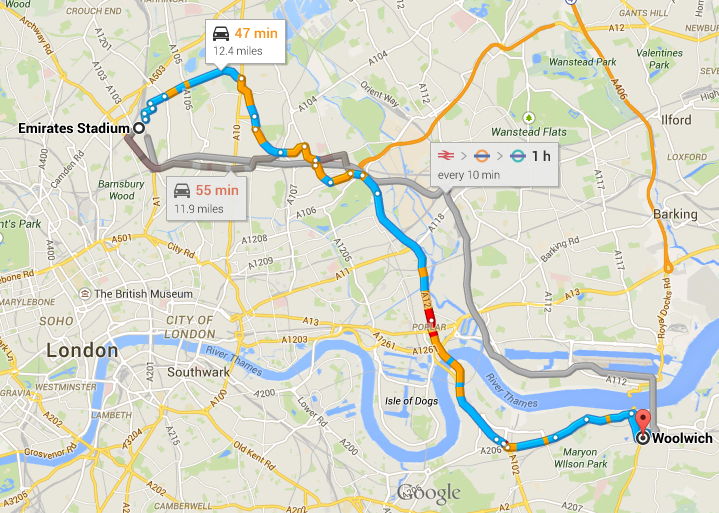 Due to the aforementioned, Henry Norris, chairman of Arsenal, decided that Arsenal needed to relocate. In 1913, the club decided to relocate to Highbury in North London, just over four miles away from Tottenham’s home ground . This angered Tottenham fans, however, the real rivalry did not start for six more years. In the 1915 season, Arsenal finished sixth in the second division of English Football (although this was later changed to fifth in 1980 when FA records showed an error in calculating goal differential) . During World War I, the Football League shut down, and league football did not return to England until 1919, when the first division was expanded by two spots, which were to be voted on by members of the FA. In 1915, Chelsea finished 17th in the top flight, while Tottenham finished 18th. Both of these teams were to get relegated down to the second division, however, due to the expansion of the first division, Chelsea was saved. The final spot for the first division came down to Tottenham, Arsenal, Barnsley, Wolverhampton, Nottingham Forest, Birmingham, and Hull. Arsenal won the vote with 18 votes, while Tottenham received 8 votes and was therefore relegated to the second division . Tottenham fans were outraged that Arsenal got in the top flight at their expense, and many are still angered to this day and believe that bribery was the reason Arsenal were promoted . Today, the rivalry is still huge among fans and players themselves. Every time when Tottenham cannot mathematically finish above Arsenal, Arsenal fans celebrate St. Tottingham’s Day. Players also take the rivalry very seriously, and love to make jabs at the opposing team and their fanbase. After Theo Walcott was injured in a 2014 FA Cup match against Tottenham, Tottenham fans began to throw coins at him while he was being stretchered off. 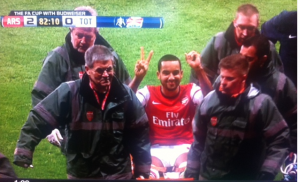 As a result, he cheekily threw up the score, 2-0, to remind fans who was winning. Similarly, during Arsenal’s FA Cup Championship Parade, Jack Wilshere took the microphone and started a chant making fun of Spurs. Soar, Phil & Tyler, Martin (2005). The Official Illustrated History of Arsenal. Hamlyn. Pages 32- 40. I am a junior at Duke studying history and economics. This past summer I worked in Brussels, Belgium and got to experience the World Cup with many Belgian fans in Grand Place, Place Lux, and King Baudoin Stadium. Their passion for the game was unlike anything I've seen before. What a thrilling match! These current Goons don’t back down one bit. Well done lads! London has an incredibly interesting soccer culture in that there are roughly 10 Premier league teams within the city – I’ve always wondered what choices go into being a Gunners vs Spurs fan, and how one chooses their allegiance. Is it based on family, history, or just preference for players and teams? Its simple. If you got dropped on your head as a baby you support spurs. if not you support Arsenal. Clearly the word “goon” is a reflection of your ineptitude as an intelligent individual and quite indicative of the morose attitude that lingers amongst many Arsenal supporters. Is it that you still haven’t recovered from your club’s inability to retain the legendary Mr Wenger or is it the realisation that Spurs are now a bigger club in every respect – the truth is often a little painful my friend. Very interesting post! As a Gunners fan, I’ve always “hated” Tottenham, but never quite understood why, despite the fact that I knew that both teams had their stadiums close to each other. It’s interesting how something that happened over 90 years ago can still spark the intense rivalry that occurs nowadays. Plus, I also find it amusing how fans (such as myself) have no idea what even started the rivalry, despite perhaps geographic location, and I think the same can be said about many young fans today in regards to rivalries in sports that began decades ago. Sometimes fans aren’t even informed and just “go with the flow,” which can be a good thing but can carry negative consequences.